Just like people, dogs and cats get sick. Accidents happen and sudden illnesses can occur at any time. It happens unexpectedly and usually means a trip to the veterinarian's office is in order. Being prepared to take on any injury or illness is important when considering taking on the responsibility of pet ownership. There are several health problems dogs and cats may visit the vet's office for more than others. These ailments are some of the more common things I've personally seen pets get sick with. Veterinarians typically see at least one dog ear infection case on their schedule every day. Ear infections can be caused by an overgrowth of yeast, bacteria, or a combination of the two. Ear infections in dogs are very itchy and you may notice your dog scratching their ears or shaking their head a lot. Thankfully, ear infections are easy to treat. Itchy skin is another common reason why dogs go to the vet. It can be caused by allergies, fleas, yeast infections, or bacterial infections. If your dog is licking and scratching uncontrollably, chances are that they are uncomfortable. Being itchy is no fun after all. It they continue to irritate their skin, a hot spot can arise. It's important to regularly groom your dog, and that includes nail trims. Most dogs need their nails trimmed about every 6 weeks. Sometimes, accidents happen and nails get broken during playtime or outdoor adventures. There is a good blood supply in a dog's nail bed, so there will be some bleeding most likely. 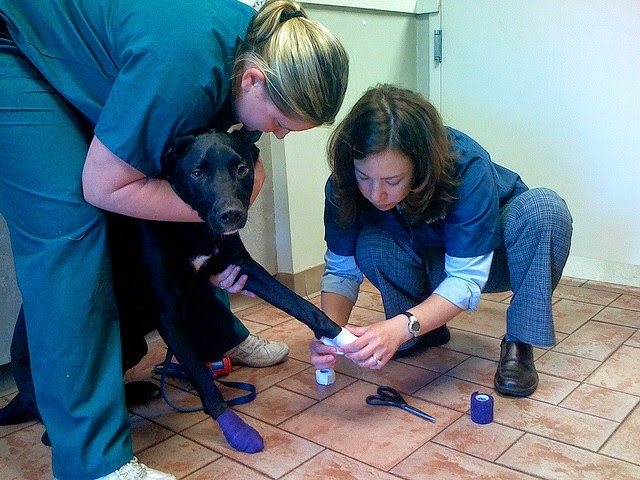 This type of injury can be painful, but a veterinarian can help. Diarrhea and/or upset stomach are two common symptoms that can be caused by a large number of health problems including stress, parvo, pancreatitis, intestinal parasites, and food intolerance. Because diarrhea in dogs can be a symptom of several different health problems, it's best to seek veterinary advice when it occurs. It's very common for dogs to get skin growths or lumps. Many times, the lumps and growths are benign but it is possible that these growths could be cancerous. One of the most common skin growths veterinarians see are Lipomas, which are growths of fat underneath the skin. One common reason why cats go to the vet's office is due to eye issues. If you notice excessive discharge coming from your cat's eye, you will likely want a vet to look at it. Outdoor cats also commonly get eye ulcers, which can be dangerous if left untreated for too long. Sometimes, newly adopted kittens or adult cats can have upper respiratory infections. This is likely from being kenneled at the shelter with other cats. Upper respiratory infections in cats can also go along with the eye problems mentioned above. They can take time and patience to clear up with medication, but it's well worth it. Cats have sensitive urinary tracts and can come down with a number of urinary health issues. These problems might include bladder stones and/or crystals, urinary tract infections, and urinary blockages. If your cat visits the litter box frequently, urinates inappropriately in the house, or seems uncomfortable when urinating then there may be a problem with their urinary tract health. Unfortunately, cats can be afflicted with all kinds of cancer just like humans. It happens more often to senior cats, but certainly could affect a younger cat as well. Any skin growths on your cat should be checked out by a veterinarian. Skin growths and masses on cats are less common than they are in dogs. This is just another reminder as to why keeping your cat indoors is safer for them. For some cats, it's easier said than done however. When outdoor cats get into fights with other neighborhood cats or strays, a bite wound can easily become infected and cause an abscess. They are usually not pretty and rupture a few days after the wound initially occurred which is when most cat owners notice there is a problem. Unexpected veterinary bills are no fun. That's why it's important to be prepared when your pet gets sick or hurt. There are two great ways you can be prepared financially for those unexpected veterinary visits. One option is to have pet insurance. Having pet insurance can help you relieve some of your financial worry if something should ever happen to your pet. Plus, it's nice to have for your yearly checkups. An estimated 40% of the cost of owning a dog goes towards unexpected veterinary bills. Another option is to set up a special savings account just for your pet. That way, if you ever need to pay for a surprise vet visit you'll have the funds to pay for it. This post is sponsored by www.pet-insurance.co.uk/. These days one of us seems to be going way too often but it is always the wise thing to do, even if we don't like it. LOL we have had more than our fair share of those. Luckily nos 2 and 3 haven't featured but the rest have one way or another. Have a fabulous Friday. I can honestly say that's what it seems like I see a lot of at the clinic I work for! The list is based from my personal experience working at a clinic so I'm sure you guys see a lot of the same things! We tend to go to the feed store for shots, but the last couple of weeks we've been to the vet several times. Flash had a big, nasty, benign tumor. And we'll be back in the next month for sedation dental cleaning for both senior dogs, which is a little pricey. 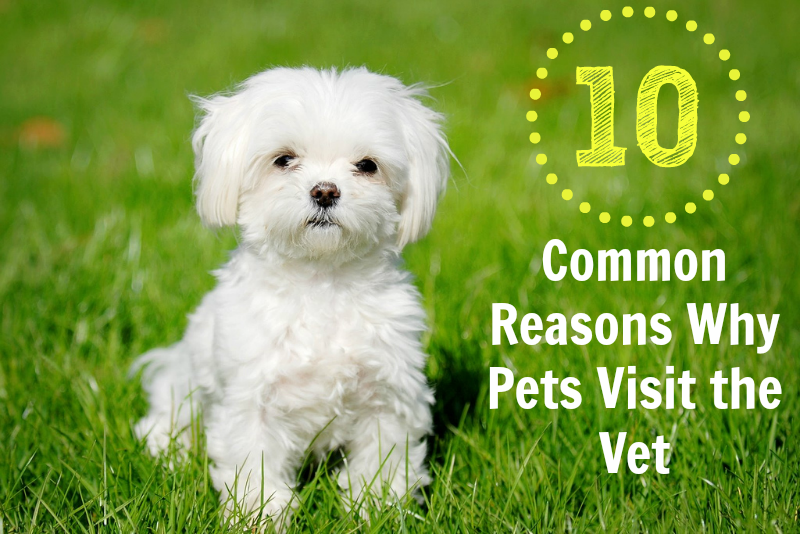 Of course, we have been to see our vet with every single one of your dog problems! I take my boys to the vet for their nail trimming. It has always been a procedure that I am an epic failure at performing. I know they pick up on my nervousness, but I am so paranoid of cutting to far and making them bleed. Great post! Luckily Laika hasn't had to go to the vet for any other than regular checkups yet. My last dog Carter, the poor thing, had 7 Lipomas over his lifetime. We were always getting a lump removed for another to take its place. The doctors I worked with didn't usually recommend removing lipomas unless they were in spots that conflicted with the animal's movement. They aren't harmful, unless they grow to really large sizes or something. Just a big blob of fat basically! Poor guy! Scout and Ash have thyroid problems and I just went and picked up more thyroid pills yesterday. And Scout always has an ear infection. Knock on wood...he hasn't had one for a couple of months! Yay! Go Scout! Seems like Shiner gets those ear infections pretty often too. 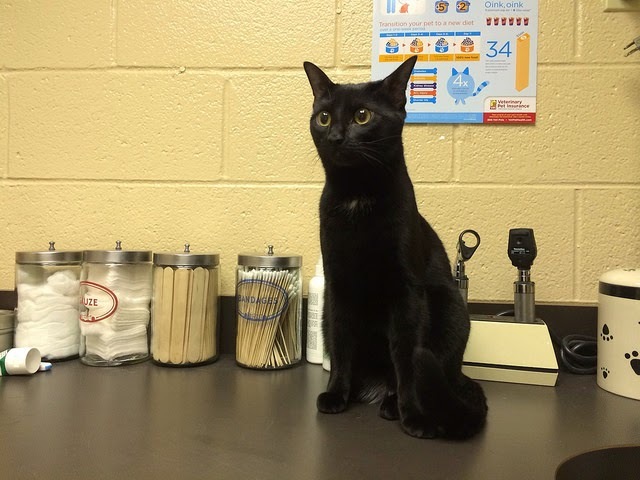 We hope all our friends stay healthy and don't have to visit the vet too often! Bruce has been seen for an ear infection, and Neeko had chronic GI issues as a puppy. I felt like we were at the vet all the time. Fortunately for us, we have only ever had good experiences with wonderful people. I've taken mine for most of these. I'm surprised about the nail one where you said every six weeks. I trim Maya and Pierson's nails every week. Bain has had a broken nail about 3 times, where it was just basically hanging. When running from the carpet to the stairs and through the kitchen, he has stubbed it on the metal that separates the carpet from the tile. He usually jumps over it, but I don't let him do the zoomies very much inside anymore. Thankfully all 3 times we did not have to take him to the vet, I could imagine the bill for something we could do at home. I cleaned it every day and bandaged it and it fell off in about a week or less.